Matthew Griswold (1714-1799) served as Governor of Connecticut from 1784 to 1786. In 1788, as delegate from Lyme, he was elected president of Connecticut’s convention to ratify the United States Constitution. Griswold’s mother, Hannah Lee (1765-1773), was the sister of Stephen Lee (1698-1783), 8th great-grandfather to Richard, James, Gary, Lisa, Carl, Jane, Bruce, Cathy, Ron, Stacey, Matt and Sandy, making Governor Griswold the first cousin to our 7th great-grandmother, Hannah Lee Lay (1720-1784). Their mutual grandparents: Thomas Lee (1641-1704) and Mary DeWolf (1656-1724). 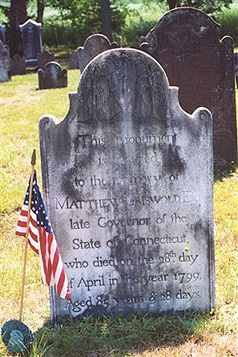 Matthew Griswold’s son Roger (1762-1812) was a member of the U.S. House of Representatives and Governor of Connecticut from 1811 to 1812.